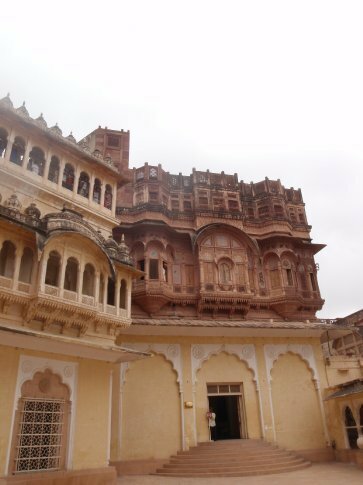 Having no hotel booked in Jodphur the rickshaw wallah took me to a place in the back streets. I didn't feel confident that Pushp would be a good place. Why would someone name their guesthouse after a push up? In fact, Pushp is named for the family that owns it and it was an excellent place to stay – very welcoming and friendly, clean and cheap. 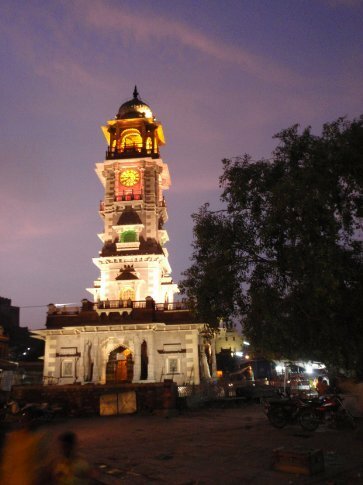 Pushp is located in a maze of tiny streets to the north west of the clock tower. After dumping my bags I went up to the roof to have a look around. My arrival just happened to coincide with a lovely old festival where everyone in town goes up to their roof and flies kites. A recent addition seems to be the blaring of banghra hits. There was a great atmosphere, young and old alike skillfully managing the simple kites made of paper and plastic. If there was such a festival in Europe I'm sure it would turn into an arms race of superkites – here everyone is happy with the simple, cheap ones. The Pushp family were very friendly and encouraged myself and the other lodgers, 2 Canadian girls and a German fellow, to try our hands at flying the kites but we were all crap. It's deceptively difficult! 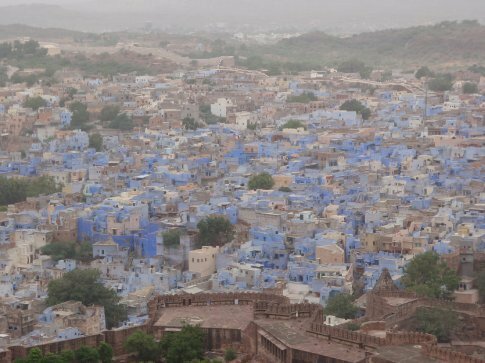 Jodphur is often called the blue city after the myriad of blue houses surrounding the massive Meherangahr fort which dominates the entire city. 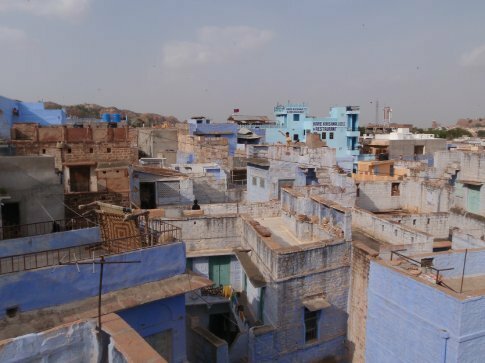 It's a popular myth that the houses are blue because that is the colour associated with the high Brahmin caste who occupy the majority of houses under the shadow of the fort. 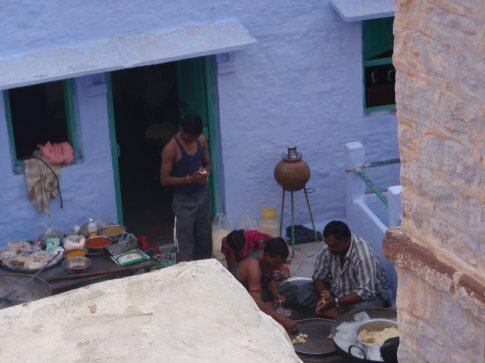 In fact the town has had a terrible termite problem for years and the addition of copper sulphate to the limestone used to paint the walls creates an attractive baby blue colour. I went for a wander around the town in the late afternoon, through the charismatic alleyways down to the elegant clock tower and the market which surrounds it. 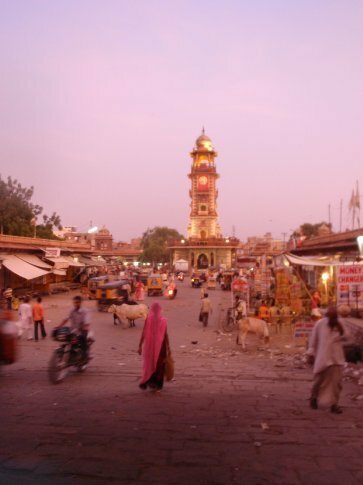 It was just closing down so there wasn'y the usual hustle and bustle but I got the impression it was a local's market where people wouldn't hassle you to buy stuff like in Jaisalmer. I finally found an ATM and returned to the guesthouse. 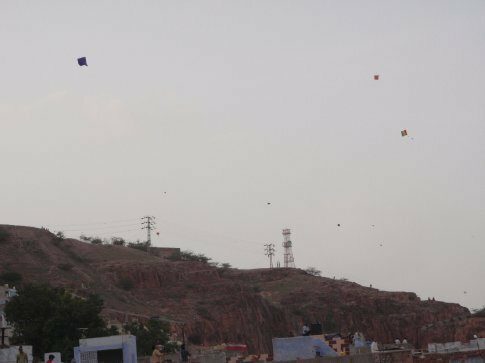 The kite flying and general festivities really heat up in the early evening when everyone comes out. The wind often gusts to break the string or cat gut that the kites are held with. Great excitement is had when someone manages to catch a kite which had been set free. 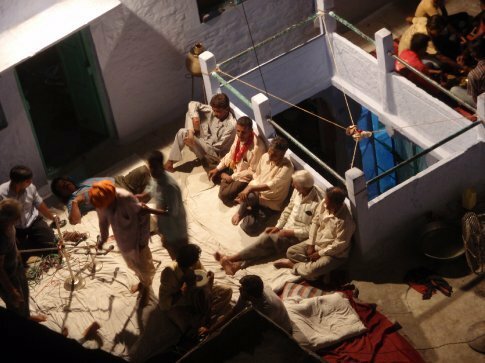 Like The family on the opposite roof were out too (everyone was) and Mr Pushp came across to us (guests) with an invitation – the daughter of the family had got engaged and they were having a party the following night – would we like to go? Well there is only one answer to that kind of question – “Of course! !” Manual, the German had been planning to leave the followong day but he changed his plans to be able to go. Jodphur had already provided an unexpected festival and an invitation to a party. I liked it already. 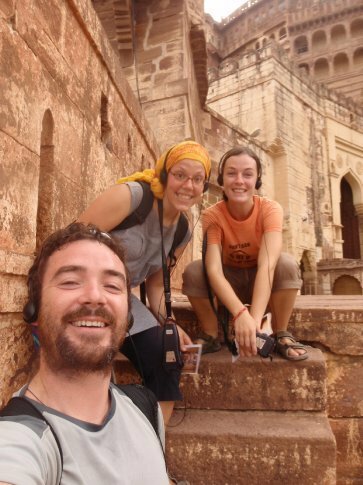 I arranged to visit the fort with the Canadian girls, Elise and Julie who were both teachers. They were good company (and yet more French language practice) as we made for the imposing building after breakfast. 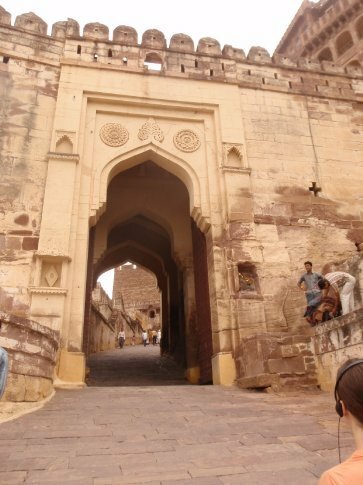 The fort was begun in 1459 by Rao Jodha but not before someone sacraficed himself to become part of the foundations as a good omen. Once again I'm not sure exactly where he fits in but he was Muslim.There is a very good audio guide which takes you through the extremely well preserved palace. 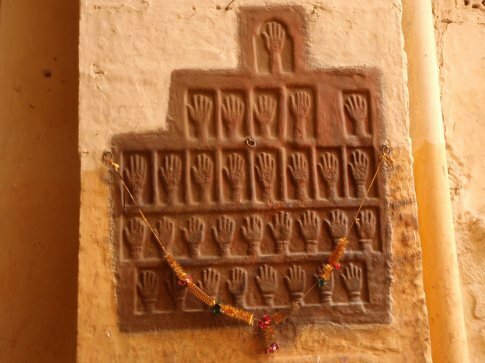 Near the spiked main gate there are the handprints of the concubines and wives of the Maharaja Ajit Singh who commited Sati. Sati is the practice of throwing oneself on the funeral pyre of the leader. It was quite common at the time! Inside the palace were beautiful displays of palanquins and howdahs and the glimpse palace, where the palace ladies in their zenana would look at court proceedings through the jali screens without themselves being seen. It was all put in context well by the audioguide and the view from the battlements was amazing. Jodphur might be twisty and easy to get lost in at street level but it looks great from above. 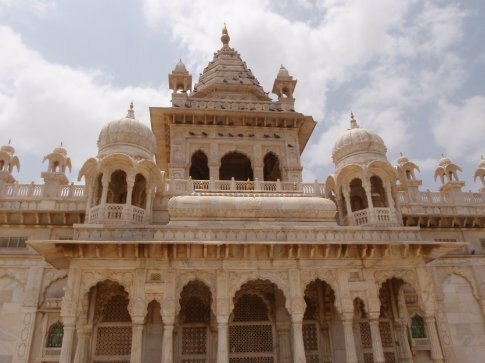 Across from the fort is the cremation grounds for the deceased royals, the Jaswant Thada. It had some pleasant gardens but a load of rip off merchant rickshaw wallahs so we ended up strolling back down to town through the windy streets to the clocktower, market in full swing now and we had lunch nearby. The girls took in a Bollywood movie while I went to find the internet and get hopelessly lost returning to Pushp. When I eventually found my way back the guys were already over at the party. 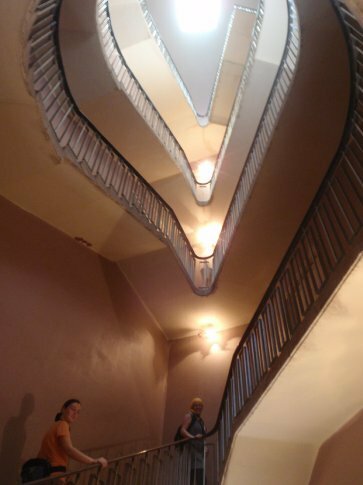 I followed them over and was lead up through ladder like stairs up to the top roof section where a few groups were sat around in the half light. The Pushp family soon joined us and a plate of delicious local delicacies was brought over. Over the shared food we chatted with those around us but it was Mr Pushp's stories of the origins of the Hindu Gods which were most memorable. 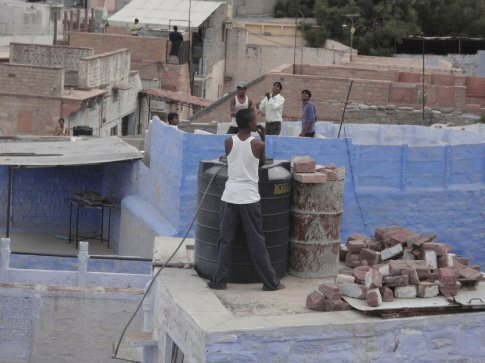 We were told to come back later after the eating for the music so we passed the time on the guesthouse roof chatting about the pros and cons of arranged marriages. Mr Pushp lives in a joint family with his brother and his wife and child. The arrangement, which he was delighted with, essentially created a family with four parents and two children. The synergy makes a lot of sense for them. Family is so much more all pervading here but I can imagine there are many drawbacks to the approach. The night grew later and there was no sign of any music so people started drifting off to bed. We were all moving on the next day, my new friends south to Udaipur on an early bumpy bus while I would be heading north to Bikaner. I had heartily enjoyed Jodphur but I felt the need to keep trucking. Just as we were saying our goodbyes the musicians started to set up but it was after midnight. When they did get going I had a front row balcony seat from my window. After an hour or so they saw me filming them and gestured for me to join them but it was late and I was happy to listen to the lilting (but very loud) music from afar. It didn't bother me in the least to lie awake listening. We really liked your blog and decided to feature it this week so that others can enjoy it too!